Load Capacity is 15 lbs. 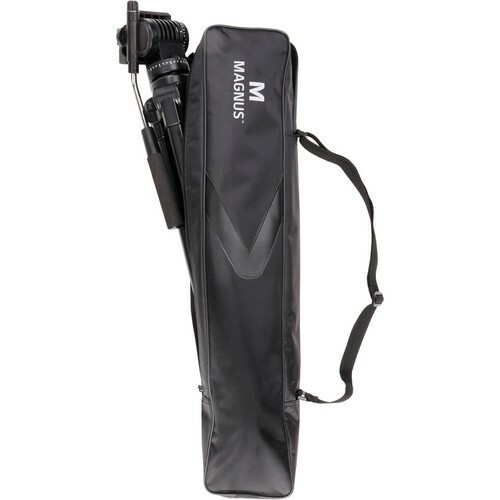 The Magnus VT-300 Lightweight Video Tripod with Fluid Head is a portable support system that provides a stable platform for shooting videos with any cameras up to 15 lb., including DSLRs and small camcorders. The built-in head features independent pan and tilt locks for fixed-position shots. This fluid effects video head pans a full 360° and tilts up and down?a pan bar and a snap-in quick-release camera plate are included. The included quick-release plate has a 1/4" camera mounting screw, a registration pin, and an anti-skid mounting surface. 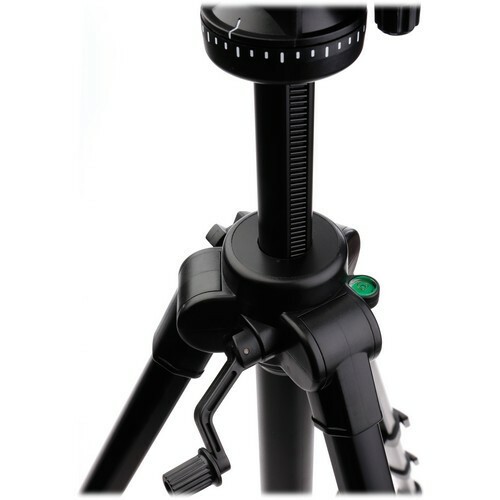 You can precisely adjust the height of the tripod using a hand crank to raise or lower the center column without moving the tripod legs. A mid-level spreader keeps the tripod stable while you adjust the tripod. It also locks to keep the legs secure when the tripod is in position. 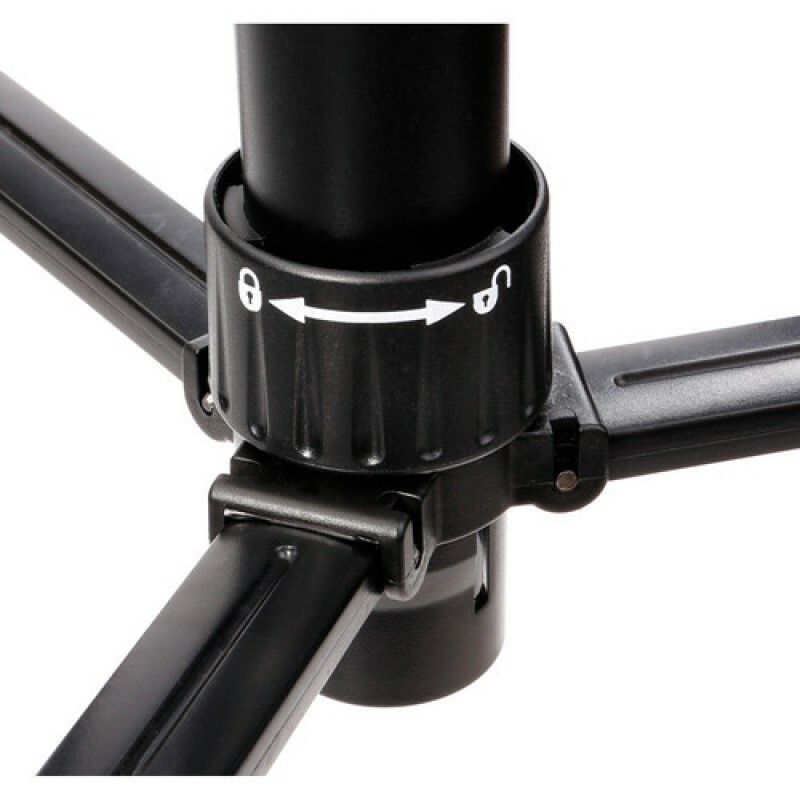 The center column and spreader are integrated for improved stability. 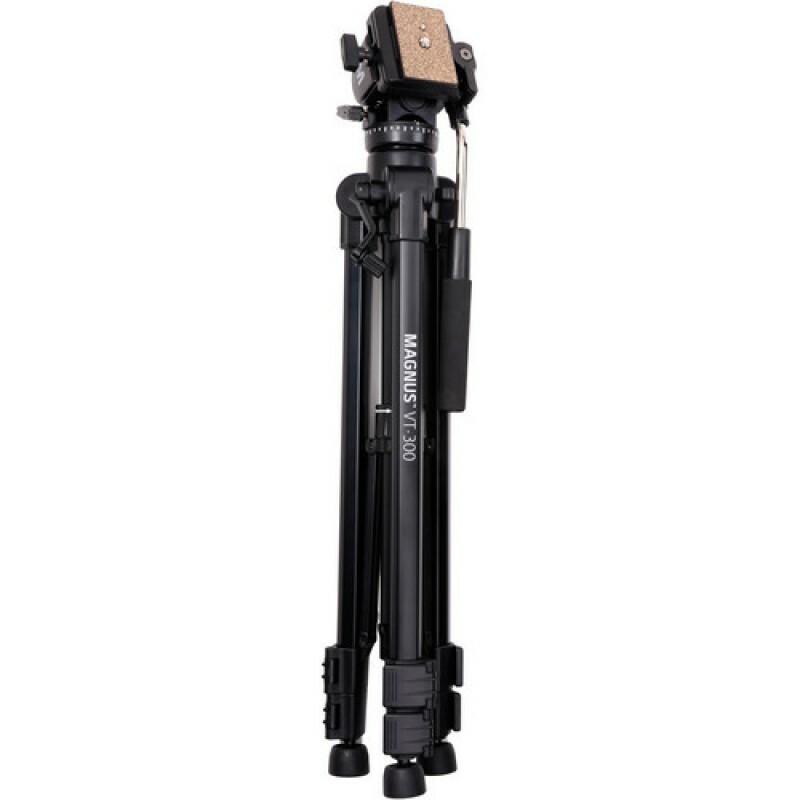 With the center-column raised, the maximum height of the tripod is 64.3". There are two leg stages for extending the legs, with flip-locks securing them. 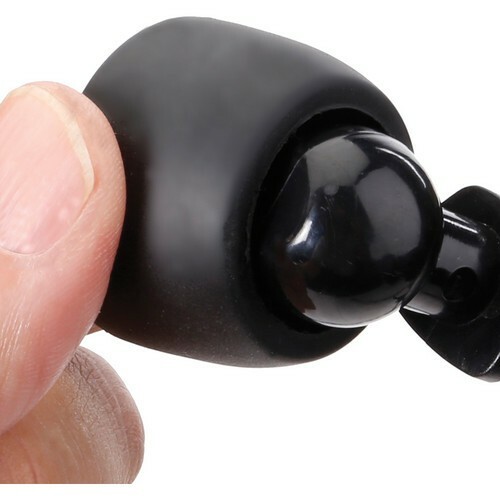 Replaceable rubber feet grip hard or slippery surfaces. When positioning the tripod on uneven ground, an internal bubble level will help you keep everything level. A shoulder strap is included with the carry case so that you can carry the tripod over your shoulder when you're moving from one location to another. Box Dimensions (LxWxH) 27.0 x 5.1 x 5.1"
This tripod is not trying to be a professional tripod and it isn't. The legs are sturdy but not as thick as the more expensive ones and I would not use it with anything more than 10 to 15 pounds. If you are on a budget though you would be hard pressed to find a deal as good as this one. The fluid head is wonderful with a great range and smooth motions perfect for panorama sweeps. Additionally, if you are inexperienced and just beginning like myself you will still be able to quickly catch on and pan smoothly. If you were buying a bunch of tripods in bulk for a non-profit or school than this is really the item to purchase. However if you need a high end fluid head you probably want to go somewhere else. This tripod is awesome and I recommend this to friends. The tilt and pan are smooth - the gel inside is amazing. It also has a midlevel spreader so I can use it in confined spaces unlike larger hearvier tripods than need a large space for leg spread. The imopressive thing is how light and portable it is but also sturdyI and durable. In fact I intended on buying a monopod. but ended up on realizing this was a muc h better option. In my opinion this tripod is better than a bunch exceeding $200, I recommend this product again and again. I use this mainly for stills and its really good. I have been playing with the tilt and pan and it seems smooth. I use a canon60D and sometimes turn it sideways for easier access for the pan tilt lever but even without doing that its a bit harder to hold the lever but its still pans smoothly. I thought I would have to spend a lot more for a good tripod. I don't know how long it will last but construction seems sturdy and very durable so I have high hopes. I suggest this to anyone who needs a a tripod. I use tripods for personal videos like family occasions, community celebrations, and vacations. I bought this one because it is cheaper than most and I needed the stability of a tripod. When I was browsing I looked at some monopods with fluid heads but because of my emphasis on stability I decided to pass on a monopod. This tripod is sturdy and the head is smooth. I look back at my older and cheaper tripod and cannot figure out how I managed. I highly recommend this item. I cant think of any thing negative about this tripod. It folds into a nice small package and is easy to collapse and unpack. The materials feel solid and the spread is wide creating a stable base. 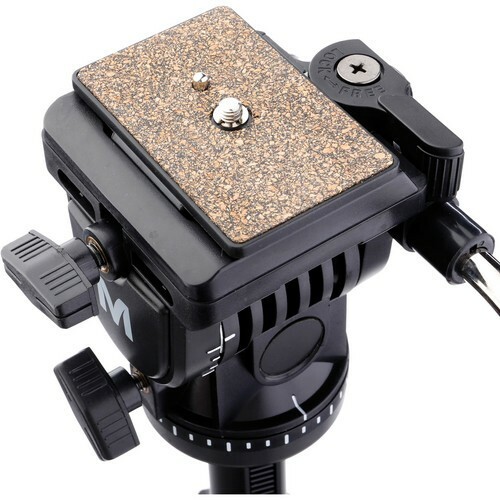 It can easily hold a regular sized video camera or even a large one with a lens. This has a nice look and a high quality finish that make the tripod seem more expensive than it actually is. Also, as others have mentioned, the panning is smooth and fine for shooting some quality video. I used to work in a production company making small video promotions for various organizations and companies. My company gave me a Bogen tripod that was high quality and really suited to my tasks. When I bought this I was hoping for something similar for use at home and on family vacations but I knew I was not spending enough for the same experience. To my surprise, the tripod is as sturdy as the Bogen while also lighter than the more expensive manfrottos I was used to. As for the tilting, I had some trouble for the first day because the tilting seemed to be stuck and I had to push with way too much force. However, after I ran it through a few times it smoothed up and I now have a really nifty piece of equipment. IT was also nice that it came with a lovely case you can use after you fold it up into a compact and small package. The feet also have great rubber tips that are great for any type of floor or ground. The only con I can really think of is the locking on the head. There is still a bit of movement after it is locked. Nothing crazy or terrible but still not completely perfect. All in all a superb tripod for a great price. 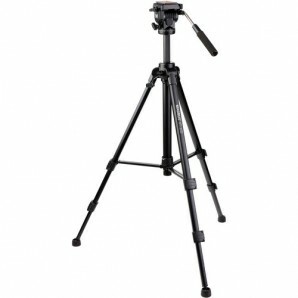 Good value for a great tripod with great movement albeit fragile materials. Over the years I have owned many different tripods at many different price points. This tripod compares well in many ways though of course there are also a few draw backs. I acquired this piece of equipment to film family vacations in some pretty spectacular places. My last trip was to the smokey mountains in Tennessee and it was the first place I had a chance to test this out. First I would like to point out that this is no manfrotto and if you are looking for the best tripod money can buy than you need to spend some more cash. The downsides I noticed with this cheaper tripod did not bother me for my uses but I will list them. The tripod is light and should not be used so support one of those giant rigs. For a DSLR with a lens you will be fine. The tripod is weighted for 15 pounds but I think that is a bit of an overestimate. I wouldn't put on much more than ten. I also noticed that the first twenty to thirty times I panned I was pushing too hard. It was very firm and it made it difficult to stop from jerking. That being said after the gel warmed up it was as smooth as butter and tilting and panning was fantastic with no jerks and only smooth video. The build quality is also not so great. It's made of a cheap feeling aluminum with a plastic head that while light does not feel as strong as I would like. Now that the cons are out of the way, allow me to explain why I am satisfied with my purchase. The mid spreader is a great addition to this tripod because it allows for setting up in confined environments. If I found myself in a crowded sideline of a football game or the edge of a smokey mountain cliff, I still had the room needed to manaeuver. The legs also lock pretty tight, something I noticed was a problem with the less pricey tripods. Most importantly as I mentioned before, the tilting and panning was liquid smooth and made for great shots. Finally the body is light and is easy to carry around with you. At this price, I am giving four stars. 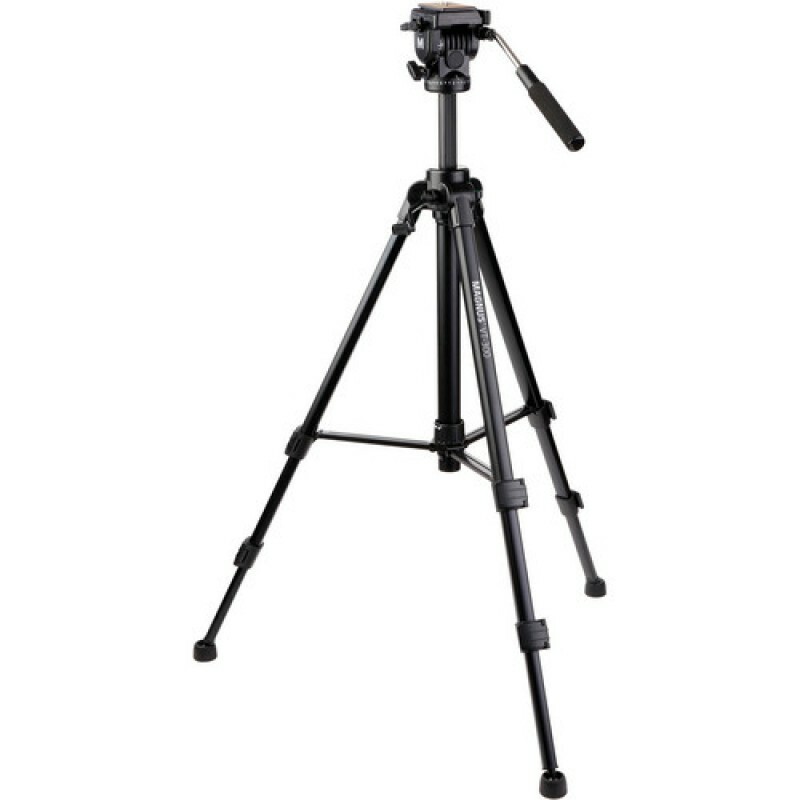 This is a good tripod that while not perfect is better than its price suggests. This is no pro's tripod but at the same time it is no supermaket junk either. I am a hobbyist film maker and I use this tripod for all of my scenes. The releasable head is a large advantage for me and you can get very smooth shooting. It is also very portable, light, and professional looking. In general this is a good tripod made great by a fair price. The tripod comes with a case and pans and tilts smoothly. The aluminum materials feel solid and easily support my DSLR. I mostly use this to film sports events and so panning is very important to me. For this reason I thought about spending more on a better fluid head but as it turns out I am glad I didn't The one thing I noticed is that the gel makes a bit of a sound when you move it around. This might get on your nerves a bit but isn't terrible. I use the this tripod mostly for filming wildlife for various youtube presentations. I use this with a small video camera but it feels like it can hold much more. Serious pro: this is truly the first tripod I have used that gives me the full free range of motion and coverage. It is pretty inexpensive but it acts like a quality product and it feels high end. This is undoubtedly one of the best tripods available today. If you are a film student whose strapped for cash or just want to make home videos then this is the product for you. I am currently using it for some church events and interviews and it’s a joy to work with. The tripod does however have some downsides. 1) I have gotten some noise when I pan. 2)If you dont properly tighten the tilt screw your DSLR or anything not perfectly balanced can tip. By Mark Wallace "M.C. Photo"